Our company offer extended trips in Peru with carefully and personalized service with English speaking guides, full equipped transports, good and responsible drivers. Our company also provide to our travelers a big bottle of Oxygen, and Medical kit to avoid the altitude sickness especially for Cusco (3,399 m.a.s.l / 11,152 ft), and Puno (3,810 m.a.s.l / 12,500ft) Chivay in Colca (3,630 m.a.s.l / 11,910ft), and Arequipa (2,328 meters / 7,738ft) South Adventure Peru Tours – Cusco work with professional and outstanding staff who give their entire time to attend our customers. We offer several LUXURY tours around Peru such as: City tour in Lima, Tour to Paracas, and Tour to Nazca, Ica Huacachina Sandboarding. The Nazca Lines are a series of ancient geoglyphs in the Nazca Desert, in southern Peru. They were designated as a UNESCO World Heritage Site in 1994. Colca canyon in Arequipa and Puno Island tour in the Lake of Titicaca, where you can immerse in one of the natural and cultural wonders in southern of Peru – Traverse the immense and solitary highlands plains (Altiplano) Colca Valley – Our organized trips includes all highlights of Colca Valley, traditional villages among impressive Incan terracing system, volcanic landscape, a lot of Andean fauna and flora, relaxing thermal pools located next of Colca River and much more is waiting for you. 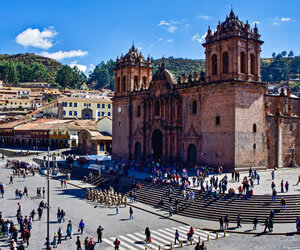 Our classic tours combines a completely guided tour of City tour , Sacred valley of the Incas , Tour to Maras Moray and salt Mines , Tour to the South of Cusco , Tour to the wonder of the world – Machu Picchu , Adventure tours such as Full day mountain biking to Moray , White water Rafting , Horseback Riding and Quad Atv. So this the best way to discover a real experience travelling with South Adventure Peru Tours – Cusco, passing the Amazing Andean landscape. However as Machu Picchu becomes more and more of popular destinations it is important to try and make your arrangements as far in advance as you can. During your whole trip in Peru, you will be able to explore the Amazon in Puerto Maldonado which is the tropical Amazon Basin. Rainforest of Tambopata national reserve located in the heart of the Amazon, where the unique access is taking motorized canoe along Puerto Maldonado or Madre de Dios River and observing wildlife on bank of the river. The climate is hot humid at all times. The average annual temperature is 26 °C (79 °F) with the months of August and September being the hottest. Annual rainfall exceeds 1,000 millimeters (3.3 ft) the west season is from October to April. The main part of the town is located on a slightly elevated are that does not normally flood in the wet season. Road travel often becomes impossible during this time. A low season occurs between June and August. A common phenomenon known locally as a surazo or friaje occurs when polar winds blow in from the mountains south. The temperature drops to as low as 8 °C (46 °F) from several days…You will also visit the city of Kings, a city full of history and cultural heritage. Travel with South Adventure around Lima and visit great convent of San Francisco, colonial gem that still today keeps all the treasures from the Spanish era. Visit some of the best museums in Lima, such as the Gold museum, Larco Herrera Museum, Museum of Archaeology, Anthropology and History. 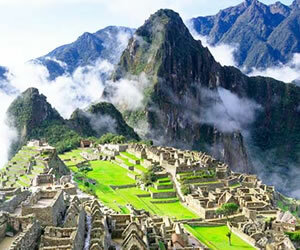 In this daily tour, you will explore the Capital city of Peru. Francisco Pizarro founded Lima in 15335. It was a vice royal capital during colonial times. These days, it is a modern and cosmopolitan city. The visit began with the Paseo de la Republican, San Martin square, Main square, Government palace, Cathedral, Archbishop Palace, City Hall and old streets with colonial mansions and Moorish balconies. San Francisco so the greatest monum bental complex of colonial art in America. We will see its basilica with 21 altars, Convent with a cloister and Clementina and Capitular rooms, choir and monk`s library, and the Museo de Profundis that has 111 canvases from Rubens School. We will also see the Sacristy, with canvas of Zurbaran and River, Gran Patio ornamented with XVI century tiles from Sevilla, Moorish arcs and finally underground catacombs of San Francisco. San Isidro Olivar, with olives brought from Spain in the XVI century, the pre-Inca worship centers of Huallamarca and Pucllana, Miraflores Parque Central (Main Park) and Parque Del Amor (Love Park) Afternoon, free time for leisure and do your own activities. This tour takes full Day tour including Nazca however, Ballestas Island are a groups of small ISLANDS near to the town of Paracas located within the Paracas District of the Pisco Province in the Ica Region, on the south coast of Peru. Composed largely of rock formations and covering an estimated are of 0.12 km2, these islands are an important sanctuary for marine fauna like the guanay or guano bird, the blue-footed booby and the tendril. Other notable species include Humboldt penguins and two varieties of Seals (Fur seals and sea Lions), amongst other mammals. 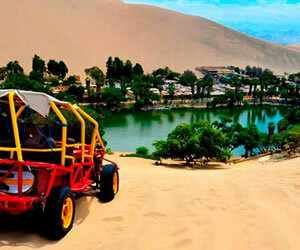 These Islands are accessible from the resort town of Paracas (Near Pisco) by tour boat which typically lasts 2 hours. During the visits it is not uncommon for the sea lions to approach the tourist boats and make spectacles for the visiting tourists. The sea lions are also responsible for a unique audio spectacle with their wolf-pack cries that echoes around the Ballestas and creates an effect of 360 degree surrounding choir. On the Island, on the Paracas Peninsula, visitors will notice El Candelabro, a large-scale geoglyph that may have served as beacon to marines. The mystery as to the origins of this particular geoglyph is ongoing with much spectaculation. The visit to the Ballestas Island is, from an ecotourism point of view, probably the best known along the Peruvian coast. Was established in 1975 and it important for the protection of both marine and bird life on the Paracas Peninsula. The Reserve is about 15Km (9.3 miles) south of Pisco. It was a saline desert formed in the place of an ancient ocean. Paracas Reserve is the home to one of the largest sea-lion colonies in the world. You can see numerous birds along the coastline, including pink flamingo. Near the reserve is a place where you can observe the life of penguins, sea lions, and many species of birds. If you are lucky you can may see dolphins during boat trips to the Island. If you visit the Islands in March you can will see female sea lions with babies – large numbers of these animals occupy the sandy beaches near the island. There are always people in Ballestas Island collecting “Guano” (Bird droppings) which is the best fertilizer and was valued more than gold at different times. When the first guano collectors arrived here there birds had accumulated guano reserves as deep as 20 to 70m (66 to 236 feet) Pisco is 240 Km ( 149 miles ) South of Lima , 210 Km ( 130 miles ) North of Nazca . chauchilla Chauchilla is cementery prehispanic mummified human remains and archeological artifacts, located 30 Kilometers (19mi) south of the city of Nazca in Peru. The cementery was discovered in the 1920 but had not been used since the 9th century AD. The cementery includes many important burial over a period of 600 to 700 years. The start of the interments was in about 200 AD. It was important as a source of archeology to Nazca culture. The cemetery has been extensively plundered by huaqueros (grave robbers) who have left human bones and pottery scattered around the area. Similar local cementeries have been damaged to a greater extent. The site has been protected by Peruvian Law since 1997. The site is by the Poroma riverbed and can be accessed off a dirt track from the Panamerican Highway in 1997, the majority of the scattered bones and plundered pottery were restored to the tombs. The Aqueducts or Puquios are an old system of subterranean aqueducts near the city of Nazca, Peru. Out of 36 puquios, most are still functioning and relied upon to bring fresh water into the arid desert. The Puquios have never fully mapped, nor have any been excavated…There is conflicting research regarding when the aqueducts were actually built. Some archaeologist’s content that they were built by Pre-Columbian Nazca architects around A.D. 540 in response to two prolonged droughts during that time, others doubt that. There is a general lack of historical reference both after and prior to the Spanish Empire. The first historical written of their existence was in 1605 by Reginaldo de Lizarraga, which some contend many indicate that they were built by by the Spanish. There, however, is yet no evidence from Spanish texts that mentions a project to build the Puquios, nor is there evidence in early Spanish text of water systems being already in place when they conquered the territory. In their book irrigation and Society in the Peruvian Desert, Katharina Schreiber and Josue Lancho Rojas explore Puquios and show evidence that puquios were constructed by a pre-Hispanic civilization. Monica Barnes and David Fleming on the other hand, argue that Schreiber et al misinterpreted evidence and that there are easier explanation for a construction in colonial times. Some investigation have been performed to determine the age of puquios also by using radiocarbon dating of organic material ( Bonn – 1972 ) and accelerator mass spectrometer to date rock varnishes ( Clarkson and Dorn 1995 ) With the technique some puquios were dated to around the 6th and 7th century AD. 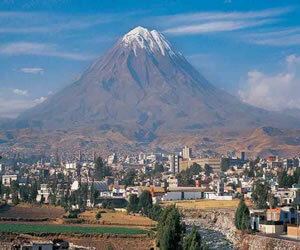 Arequipa is the capital and largest city of the Arequipa Region and the seat of the Constitutional Court of Peru. It is Peru`s second most populous city with 861,145 inhabitants , as well as its second most populous metropolitan area as of 2016, according to the National Institute of Statistics and Informatics ( INEI ) Arequipa is the second most industrialized and commercialized city in Peru. Its industrial activity includes manufactured goods and camelids wall products for export. The City has close trade ties with Chile, Bolivia and Brazil. During your 3 hours of tour, you will visit the following attractive touristic places. The Basilica Cathedral of Arequipa: Where you will visit the two jewels of the City of Arequipa; the Belgian organ and the pulpit of French origin made in Lille by famous French artist business Rigot. The Church of the Jesus Company: A beautiful church with an impressive frontage of half-caste, baroque style, and here we can find elements of Native and European decoration, where you can interpret the iconogragy of the epoch. The dome of San Ignacio de Loyola and the Cloisters of the Company: In this dome we see a polychrome decoration made with natural dyes and see a beautiful painting of Bernado Vitti, (Artist Jesuit) that represents San Ignacio of Loyola in the storta. Inside the church we can appreciate the works of another interesting artist – Diego Portales; it is presumed that he was a pupil of Pedro Pablo Ruben`s in Europe. Diego portable painted pictures such as Jesus entry to Jerusalem and the last supper; in the middle of the table you can see Andean elements as a guinea pig. The Monastery and Saint Catalina Convent of Siena: Which dates back to the end of the 16th century. It represents to the Spanish influence; this place is considered to be a citadel inside the city of Arequipa. It is rich in architecture and painting. It the year 1970 a part of the monastery opened itself for visitors. It has a current area of 20426.00 square meters. In its day there were 500 women of whom 180 were religious and the rest there were the minders (servants) who were serving the nuns. Even now nuns still live in the northern area of the convent. It is well-known for lodging women of the colonial epoch and some of these women had been forced by their own families to devote themselves to the religion. Ideally it was also a way of sheltering of the society male chauvinist of the colonial epoch. In this tour, we will also able to combine with other colonial places of Arequipa with the surrounding which is found located in a quarter of colonial style. Yanahuara and also we will visit lookout point of Carmen Alto where there exists Pre-Incan terraces, and excellent lookout point Chilina valley and the three volcanoes such as Misti, Chachani and Pichu Picchu. Colca Canyon, a river canyon in southern Peru famed as in of the World`s deepest, is a well- known trekking destination. It`s a habitat for the giant Andean Condor, on view from overlooks like Cruz del Condor. The Canyon landscape comprises a green valley and remote traditional villages with terraced agriculture that predates the INCAS. Its Colca River is popular for White water Rafting. This one of the fantastic tour from the Second deepest Canyon of the World to the Highest Navigable Lake of Titikaca OR Viceverse. Our tour takes us the highway from Yucra, bordering the snow – covered Chachani Mountain towards Pampas. We will have small break at Aguada Blanca (National Park) for Coca tea and use the restrooms, we will also see the habitat of the beautiful South American camellias such as Vicuñas, Alpacas, and Llamas. At Tocra lake, we will see differents kinds of birds, flamencos, we will pass once of the biggest crater of an extinct volcanoe of Chucura and then we will stop at the famous volcanoes Panoramic viewpoint 4,800 m.a.s.l. 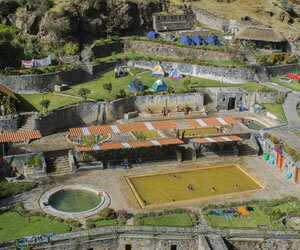 We will appreciate the Pre-Inca farming terraces, Platforms known as andenerias. Spend the night at Colca Canyon (3,630 /11,910ft) after meals, enjoy the thermal baths oscillate between 32º to 37º degrees Celsius. South Adventure Peru Tours invite you to purchase this trip and immerse in one of the natural and cultural wonders in Southern of Peru – Traverse the Immense Colca valley, traditional villages among impressive Incan terracing system, volcanic landscaped, lot of Andean fauna and flora, relaxing thermal pools located at Chivay Mountain. The SECOND day of the trip, you will be guided to the famous Condor Cross , where you will appreciate the fly of the huge Condors ( Amazing biggest birds ) or sometimes just seating on the big rocks. Before midday, you will return to Chivay for lunch and then, you will be able to buy some handicrafts in the local markets, green villages on the both banks of the canyon and local people working the ancient`s Pre-Incas terraces and dedicated life solely to work the terraces, therefore you will see many fields full of crops as corn, amaranth, kimchi, potatoes, Quinoa etc. etc. After spent few hours, we will catch the transport straight to Puno but on the way, we will appreciate many small lagoons and on there, we will see Andean birds as Black caracara, Andean goose, Pink flamingos, ducks ibis and more. Our services also includes other stops to enjoy more scenery along the way making this transfer more flexible and arrive to customer hotel in Puno between 6 to 7pm and drop off at your Hotel. Puno is a city in southeastern Peru, located on the Shore of Lake Titicaca. It is the capital city of the Puno Region and the Puno Province with a population of approximately 149,064 (2014 estimate). The city was established in in 1668 by Viceroy Pedro Antonio Fernandez de Castro as capital of the province of Paucarcolla with the name San Juan Bautista de Puno. The name was later changed to San Carlos de Puno, in honor of King Charles II of Spain. Puno has several charges dating back from the colonial period; they were built to service the Spanish population and evangelize the natives…Puno is an important agricultural and livestock region; important livestock are llamas and alpacas, which graze on its immense plateaus and plaints. Much of the city economy relies on the black market, fueled by cheap goods smuggled in from Bolivia. Puno is served by the Inca Manco Capac International Airport in nearby Juliaca. Climate: As Puno is located at such a high elevation, it experiences more extreme weather conditions than would be expected for its tropical latitude. The average annual temperature is about 8.4°C. And the weather never gets overly warm. During the winter months from June to August, night- time temperatures usually drop well below 0 °C. . At this high altitude, the rays of the sun are very strong. Most of the annual precipitation falls during the southern hemisphere summer, with the winter months being very dry. Uros Island: The Uros are a people who live on forty – two self-fashioned floating Island in Lake Titicaca Puno, Peru and Bolivia. They form three main groups: Uros-Chipaya, Uros-Muratos and the Uru-Iruitos. The latter are still located on the Bolivian side of Lake Titicaca and Desaguadero River… Its inhabitants, the Uros tribe, pre-date Incan civilization and continue to hurt and fish the plentiful land and waters they occupy. The Uros descend from a millennial two that, according to legends, are “Pukinas”who speak Uro or Pukina and that believe they are the owners of the Lake and water. Uros used to say that they have black blood because they did not feel the cold. Also they call themselves “Lupihaques” (Sons of the Sun) Nowadays, Uros do not speak the Uro language, nor practice their old beliefs, old beliefs, but keep some old customs. The Uros traded with the Aymara tribe on the mainland, intermarrying with them and eventually abandoning the Uro language for that of the Aymara. About 500 years ago they lost their original language .When conquered by the Inca Empire, they had to pay taxes to them, and often were made slaves. The Uros use bundles of dried totora reeds to make reed boats (Balsa mats), and to make the Island themselves. The larger Island house about then families, while smaller ones, only about thirty meters wide, house only two of three. Taquile Island: Is and Island on the Peruvian side of Lake Titicaca 45 Km offshore from the city of Puno. About 2,200 people live on the Island , which is 5.5 by 1.6 Kilometers ( 3,4 by 1.0 mile ) in size ( maximum measurements ), with an area of 5.72 km2 ( 2,21 sq mi ). The highest point of the Island is 4,050 meters (13,285 feet) above seas level and then main villages is at 3,950 meters (12,959 feet) the inhabitants, known as Taquileños, speak Quechua. In 2005, “Taquile and its Textil Art” were honored by being proclaimed “Masterpieces of the Oral and Intangible Heritage of Humanity by UNESCO” Taquileños run their society based on community collectivism and on the Inca moral code: AMA SUA (Do not steal) AMA LLULLA (Do not lie) AMA QHILLA (Do not be lazy) The island is divided into six sectors or suyus for crop rotation purposes. The economy is based on fishing, terraced farming horticulture based on the potatoes cultivation, and tourist-generated income from the approximately 40.000 tourists who visit each year. Amantani Island: Is an Island on the Peruvian side of Lake Titicaca. According to a 1988 census, it has a population of 3,663 Quechua speakers divided among about 800 families. The island is circular and about 9.28 km² in size. It has two mountain peaks. Pachatata (“Father Earth”) and Pachamama (“Mother earth “), with ancient Inca and Tiawanaku ruins on top of both. The hillsides are terraces, mostly worked by hand, and planted with wheat, quinoa, potatoes, and other vegetables. Livestock, including alpacas graze the slopes. Amantani is known as the “Island of the Kantuta”, after the national flower of Peru and Bolivia, which grows plentifully on the Island.